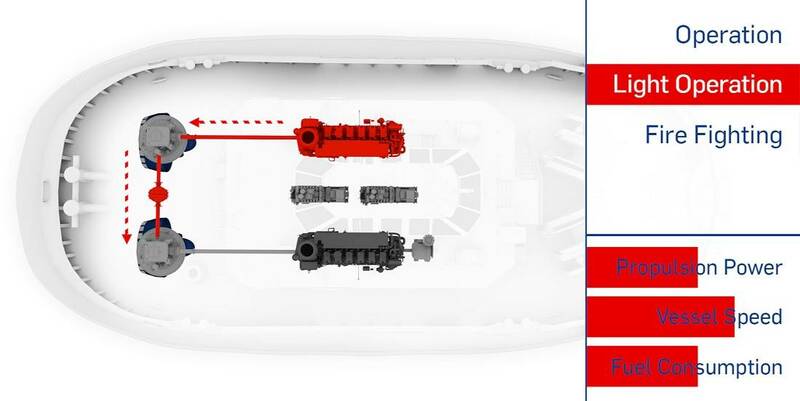 In a close collaboration with Svitzer of Denmark, SCHOTTEL has developed a new hybrid propulsion concept. The new concept is based on the recent SCHOTTEL Y-Hybrid thruster technology and connects a port and starboard mounted azimuth thruster in a vessel with each other. This makes it possible to drive two thrusters with either one of the main engines. The companies are now discussing a pilot project to retrofit an existing tug with the new mechanical hybrid technology. This will transform the direct driven vessel into a greener and more cost-efficient vessel. Svitzer runs a fleet of 430 vessels and operations all over the world, and is having a high focus on innovations and options for fleet modernization. Thomas Bangslund, Group Head of Innovation at Svitzer, was closely involved in the development of the synchron-mechanic hybrid drive system. Svitzer is convinced of the operational and environmental benefits of the new SCHOTTEL SYDRIVE-M in both retrofits and newbuilding projects. 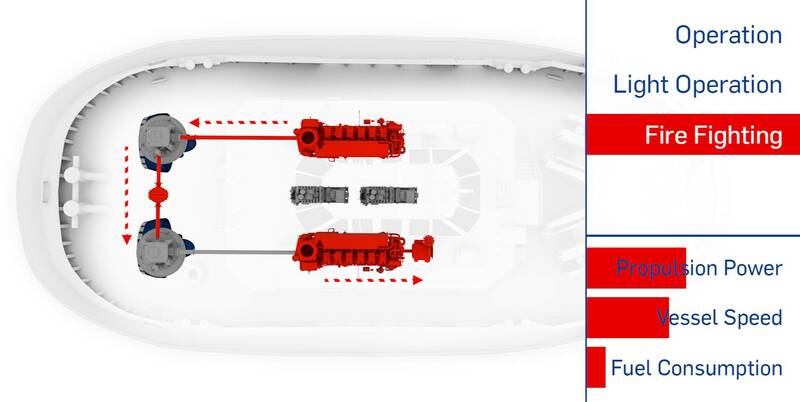 Light Operation or Free Sailing Mode: The core functionality of SYDRIVE-M is to mechanically connect two thrusters and one of the two main engines for all light operation activities which do not require full power of the two main engines. In this synchronized Light Operation Mode, one of the two main propulsion engines remains alternating off. This leads to a noticeable reduction of operating hours of the main propulsion engines, and thus to a reduction of maintenance costs. In addition, the single running main engine remaining in operation is now better loaded by two thrusters and operates in a better specific fuel consumption range, leading to less fuel consumption and emissions. In contrast to a conventional tug, with two engines running in traditional Light Operation Mode, where both engines are operated at a relatively low rpm range which is not efficient with regard to fuel consumption and emissions. 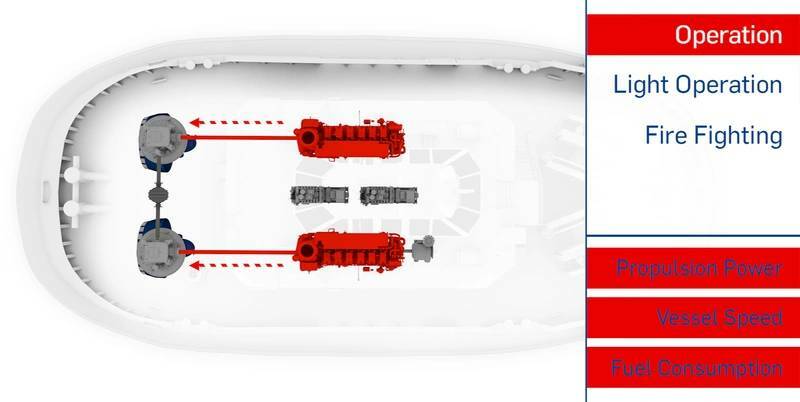 Full Thrust Operation Mode: For short operation times when full propulsion power is needed, the connection between the two thrusters is disengaged and each engine is engaged to each thruster. The system is now identical to any other directly driven propulsion system. FiFi-Mode: For any directly driven vessel the new SYDRIVE-M system provides a solution to enable fire-fighting operation with no need of an additional investment in components like medium or heavy duty slipping clutches, CP propellers or dedicated engines to supply power to a FiFi-pump. For the SYDRIVE-M FiFi-mode, the disengaged main engine is used to drive the FiFi-pump through its front PTO.